The Norfolk Coast Path runs from Hunstanton to Sea Palling, across some of the most scenic countryside in the UK, and through the unspoilt landscape of Norfolk’s ‘Areas of Outstanding Beauty’. We’re starting to do more walking, now that our kids are a bit older, and have found their hiking legs. It’s good exercise for Helen and I, as we try to delay middle age spread, and gets the kids off the Internet and immersed in the Real World for a few hours. It’s also, in my honest opinion, one of the best ways to explore the area. 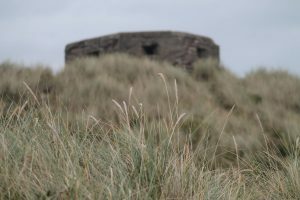 Over the October half-term, we explored the Norfolk Coast Path in chunks, from Sheringham to West Runton, then onto Cromer, Blakeney to Morston Quay, from Weybourne back to Sheringham, and a short hike from the car park to Horsey Gap. We decided to walk to West Runton via the beach, rather than over Beeston Bump. Sheringham’s solid beach defences end just east of the town, leaving us walking on sand and shingle. The tide was in, so we were walking inside the wooden cliff defences. 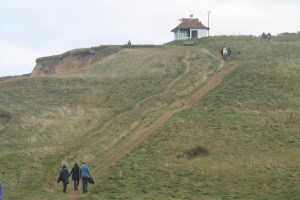 Heading up to the caravan parks via the steps, and looking back towards Sheringham, gave us a grand view of Beeston Bump, with plenty of folk walking over it in both directions. We stopped at West Runton and popped into the Beach Cafe for a coffee. I had a quick chat with Louise, the owner, who pops up on social media with some terrific coastal photographs she’s taken. Warmed up, and energised by coffee, we headed towards East Runton. Our original plan was to walk back from here, but I convinced Helen that it was worth pressing on, given how close Cromer was, on the understanding that we caught a bus back to Sheringham. Walking through one of the caravan parks we encountered a family who had converted a yellow double-decker bus into a mobile home. It was a bit of an eye catcher, and we spent a few minutes discussing with them how cool it was to have such an interesting mobile home! The final part of the walk into Cromer is on footpath along the main road, then down the slope to the promenade. We had a quick look at the pier, then caught the bus back to Sheringham, grateful for the frequent service between the towns. We did this shorter walk with Helen’s dad, who normally struggles to walk any distance, and our kids. Here, the Norfolk Coast Path follows the salt marshes, so is largely on the flat, apart from some steps up an earth embankment mid-way. We parked up in the NT car park at Blakeney, and had a hearty lunch at the Kings Arms. 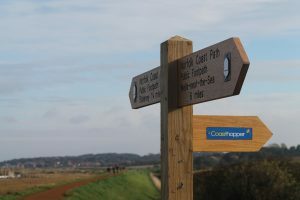 The coast path is adjacent to the pub, just behind the village sign. There were plenty of people walking that day, and we even chanced upon a very sociable horse, who was enjoying all of the attention from passing families. If I’d have known, I’d have packed some sugar cubes. I am often stunned into silence whilst walking in Norfolk, it feels like a shame to spoil it by speaking. There are boats moored as you near Morston Quay, in a very practical and sea faring way; it’s scenery that seems to be unique to the UK. The highlight of this walk was the train ride from Sheringham to Weybourne, along the Poppy Line. We were joined on this walk by Helen’s cousin and his new girlfriend. Helen’s dad accompanied us on the train journey, catching the return back. It’s a short journey, the relaxing rhythm of the pistons gently rocking the carriages is a welcome change, and gives us all an opportunity to talk, and watch Norfolk unfold out of the windows. 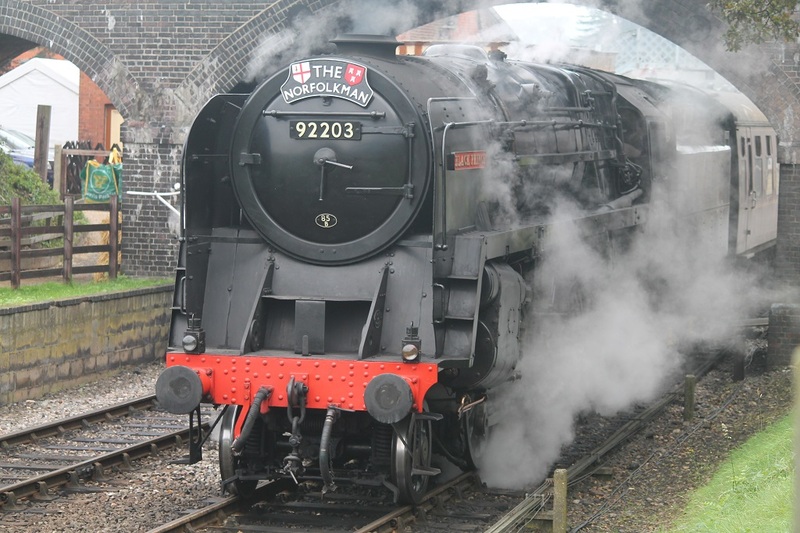 We fuelled up at Weybourne with a picnic lunch, and enjoyed pottering around the station. It’s smaller than Sheringham Station but is as well maintained, boasts a small shop and buffet, a signal box, and a delightful model railway. The station is about a kilometre from Weybourne Village, so we headed over the bridge, towards Weybourne Beach car park. Thankfully there is a footpath separating pedestrians from cars. 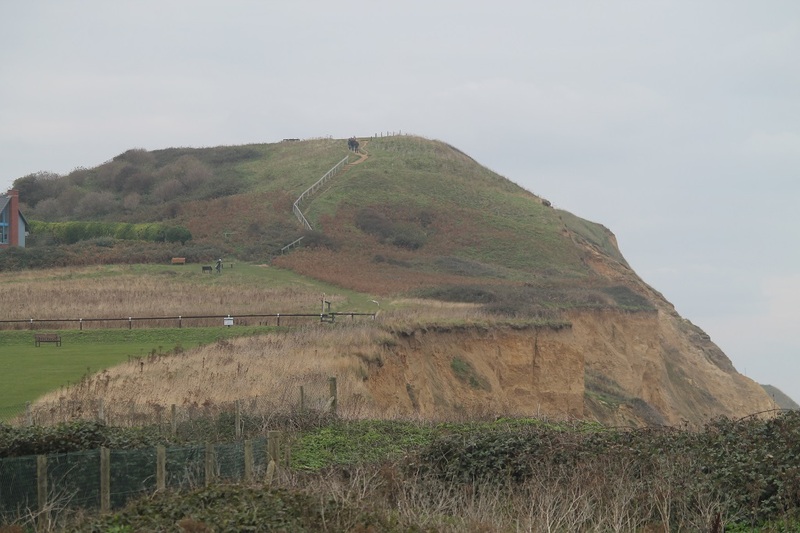 The walk from the car park back to Sheringham is undulating – let no one fool you into believing Norfolk is flat! Our kids walked on ahead, setting the pace somewhat. In the distance we could see steam and diesel locomotives shuttling holidaymakers along the Poppy Line, and the odd pill box, a reminder that the coast has not always been so peaceful. Skelding Hill is visible in the distance, with the old coastguard lookout station in sight. As we approached this, passing the golf course on our right, we knew that we were on the home run. Upon joining the High Street, we treated ourselves to a Ronaldo ice-cream from Ellie’s. 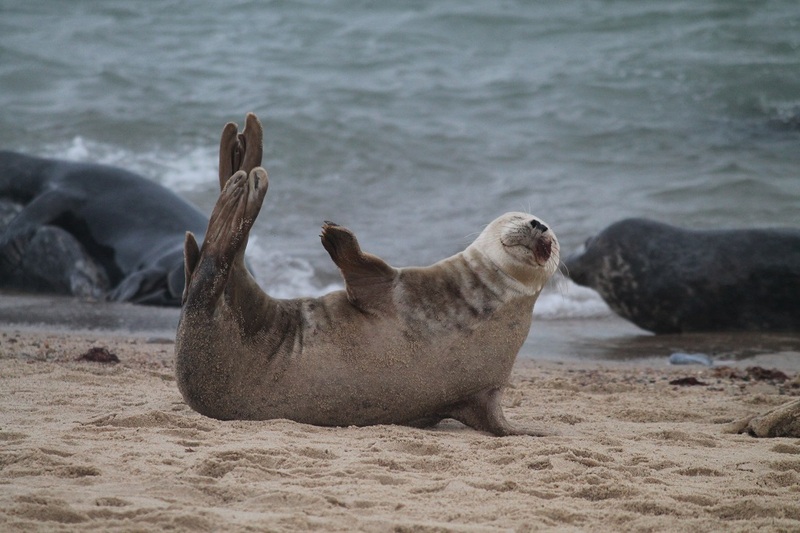 We rarely explore the eastern side of Norfolk, but had been inspired to drive over and see the seals of Horsey Gap after my brother told me it was something we must simply do. After dining at a nearby pub (the excellent Hill House Inn in Happisburgh), we drove along the coast to Horsey Gap. We parked up at the first pay-and-display car parks and set off alongside the dunes to the beach entrance. The Norfolk Coast Path here is in good condition: on the level, suitable for buggies, though the final bit onto the beach can be a bit of a clamber over the beach defence. Upon reaching the beach, I was first astounded by how many seals there were on the beach, then astonished by how close one could get. 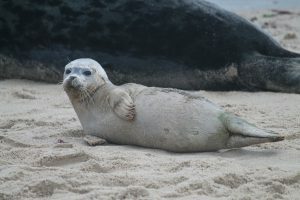 I’d heard that grey seal pups had been born in the local colony, but was not expecting to see so many youngsters on show. 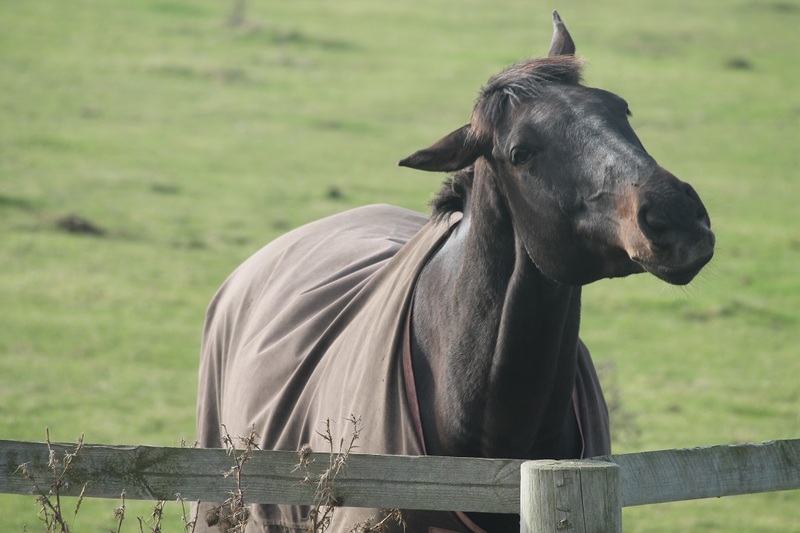 Thankfully, I’d packed a good zoom lens for my camera, so was able to take loads of photographs whilst being mindful to keep a respectful distance from these wonderful creatures. I was grateful for the fact that others on the beach who had come to see the seals were doing the same. 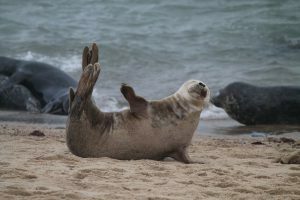 The seals seemed quite relaxed amongst us, and we spent a good hour or so watching them play in the surf. This was very much the highlight of the holiday for me, and I would highly recommend this activity for a family afternoon out on a dry October afternoon.